Joseph Sylvester Vinson Thompson was born at Manilla, NSW in 1884, the third and youngest son of four children born to Henry John and Margaret Elizabeth (nee Hagan) Thompson. At the age of 31 years he enlisted in the AIF (Regimental Number 2883A) on the 9th of July 1915 at Brisbane, stating that his occupation was as a Police Constable at Bell, Queensland. He listed his mother, Margaret Elizabeth Thompson of Sandringham, Barraba, New South Wales, as his next of kin. Initially he was posted at the rank of Private to the 25th Battalion/6th Reinforcements at Enoggera near Brisbane. On the 21st of October 1915 at Pinkenba, Brisbane he embarked on the HMAT A48 Seang Bee bound for active service, arriving at Suez on the 28th of November 1915. Upon arrival it appears that he was assigned to the 7th Training Battalion at Zeitoun. On the 27th of February 1916 he was allotted to and proceeded to join the 9th Battalion. The next day he joined the 9th Battalion “D” Company at Gebel Habieta, about 12 miles (20 km) east of the Suez Canal. There is no record of when he received his promotion however when he transferred to the 9th Battalion he reverted to the ranks but was immediately afterwards promoted to the rank of Corporal in his new unit. On the 27th of March 1916 he was with troops who embarked at Alexandria on the HMT Saxonia and sailed to join the British Expeditionary Force, disembarking in Marseille, France on the 3rd of April. He’d have gone by train to northern France and from there he would have been posted to active duty on the western front in the Somme. 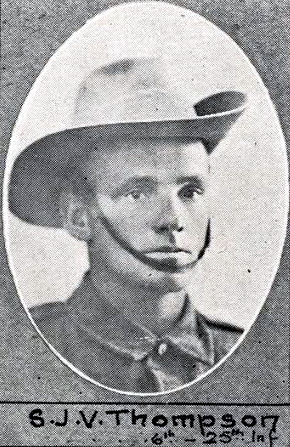 Corporal Joseph Thompson was killed in action while fighting near Pozieres in the Somme, France on the 22nd of July 1916. He has no known grave and is commemorated at the Australian National Memorial at Villers-Bretonneux, France.